Charms naughty or nice suckers. 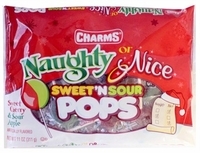 You get a sweet cherry and sour apple flavor all mixed in one, the wrapper even says naughty or nice. A great Christmas Stocking candy. Each sucker is approx 1 1/2" on a 3 1/2" stick.